Nicholas studied at Newcastle College of Art and Design and University of Central Lancashire where he developed an interest in glass work. He has a long-standing fascination with optical art, minimal designs that hold the viewers attention through simple colour pattern and form, his aim is to create functional pieces that play with the viewer. 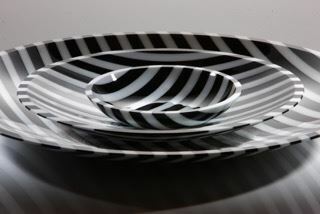 He produces designs in very limited quantities as editions, quality crafted pieces using kiln forming glass techniques. He primarily use opaque and semi translucent glass which are notably complex in their nature. His designs are formed using moulds and are finished by hand using diamond tools and many pieces are signed. Nicholas philosophy is to produce exceptionally designed pieces, creating objects that bring together both function and visual appeal with a permanent value.